The short answer is yes if the rate is lower. You may choose an alternative competitive energy supplier, but it is not required. It is possible, but not guaranteed, that you could save money by choosing your own supplier. Energy Price Choice™ will do everything they can to make sure you get the best possible energy rate. In the rare chance they cannot find you a better rate than you are currently paying now, then they will inform you and suggest you stay with your current provider. Some customers may also be interested in whether the source of a supplier's electricity is renewable or "green." EnergyPriceChoice.com leads you through the search to find a lower energy prices and then to sign up to purchase the energy. The process is so easy and simple that you probably will not need the information below. This is just to answer any question that may arise as you go through the sign up process. Have your utility bill with you to complete the sign up process. Step 1: Enter your zip code in the designated box and click on the "Submit Your Zip" button. Step 2: Check residential or commercial and click the "Next Question" button. Step 3: Check electric or gas. You can sign up for either or both. After you choose one in step 6, you can come back and look at the prices for the other. Click the "Next Question" button. Step 4: Choose your utility from the drop down box if the utility company shown is not yours. Click on the "Next Question" button. Step 5: Choose when you want to start your new service. It will automatically show you the next available start date. Step 5a: Skip this step if you chose "Residential" in Step 2. Business pricing is based on energy usage tiers and rate classes. Enter in the annual usage from your utility bill. Click "Next Question". Step 5b: Choose from the available rate classes from the drop down. You can find examples of where to find your rate class by clicking on the link "Click here" next to the drop down. Step 6: Offers will appear and you can choose the price and contract length that works best for you. Compare the offers with the price listed on your utility bill to see how much you will save. Click on the "Sign Up" button. Step 7: Click on the "Accept Offer" to move forward. Step 8: Review the information in your cart. Read the terms and conditions. Click on the box next to the "Confirm" button to accept the terms and conditions. Step 10: To process the deal, energy suppliers need a copy of your most current utility bill. Scan or take a very clear picture of your utility bill. Click the "Choose Files" button to upload your utility bill. If you are using a smartphone, you can take a photo and upload it to the information page. If you don't have a scanner and are using a PC, take a clear picture with your phone and email it to yourself. From there, you can download it and upload it to the site. Step 11: Sign the form in the box at the bottom using the mouse if you are using a computer or a stylus or your finger on a smartphone. Click "Submit". Step 12: Review the information to ensure it is correct. If everything looks right, click the "Confirm" button. You will be taken to a thank you page and receive a confirmation email to the email address you provided. The last thing to do is to enjoy the savings! The short answer is no you can't switch suppliers. While there may still be options available, those options are usually controlled by the decision makers of the co-op or municipality. It is up to your co-op whether to participate in the deregulated market or not, but most have chosen not to. You could speak to your board members and see how they feel about switching suppliers. If your municipality already participated in an energy aggregation program, you can only change your supplier when the contract expires. If your co-op or municipality is interested in starting an energy program, please contact David Ramos, david@energypricechoice.com, for more information and to see what options we have available for you. The links below can help you understand your electricity bill better. If you cancel your service early, most suppliers will charge you an early termination fee. This fee funds the recovery of historic above market expenses incurred through power contracts and other investment obligations. This is specfic to each supplier. You can see the early termination fee on the rates of each supplier. To see the terms and conditions for each supplier, CLICK HERE. Choosing a new competitive energy supplier is easy. If you know basic computer knowledge, you should find switching energy suppliers as easy as finding a hotel room, booking a flight, or choosing car insurance online. Put your zip code in the text box on the homepage of energypricechoice.com and follow the process. We will take you step by step through the entire process. If you need more help, please visit our "Get Started" page for a checklist of what you need, videos, and much more help to get you started saving money. If you have an account in “good credit standing,” you are eligible to participate. 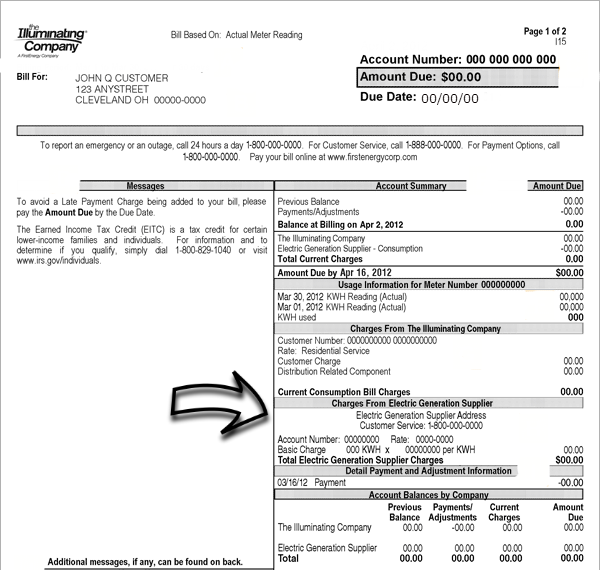 An account in “good credit standing” is one in which the account does not have a deliquent past due balance or a disconnection notice. If you are in a current agreement with an energy supplier, you can switch suppliers but they will most likely charge you an early termination fee. You can see the termination fees of our suppliers with the rates on the Get Started page or you can call your current supplier. The phone number is found on your utility bill. It is the option to purchase your natural gas supply from an alternative natural gas supplier. Whether you decide to purchase your natural gas supply from your local natural gas utility company or switch to another company for your gas supply, your local natural gas utility company will continue to deliver the natural gas to your home or business. The natural gas supply itself, meets the same requirements and pipeline standards whether it is purchased from the utility company or an alternative supplier. Your neighborhood utility company would still provide the power distribution and services. Where the utility company gets the power or natural gas from is of little consequence. You still get the same uninterrupted energy service, just a lower, more competitive rate on the supply. Same service, better rate. Besides the lower energy rate, not much changes for you. The utility company is still responsible for the distribution of the electricity and natural gas to your homes and businesses, regardless of the energy supplier. The price for the electricity and natural gas supply is not set by the utility company. You can now choose who you want to supply the energy to your local utility company. In most cases, your current local utility will still bill you. In some cases, you can choose to pay the supplier separately. A competitive energy supplier is a company that is certified by a state’s public utility commission to generate or deliver natural gas and/or electricity to local distribution companies (utility companies). They are separate entities from the utility companies. They focus mainly on energy supply only. The competitive energy suppliers compete with each other to provide energy to you. This competition drives the costs down and passes the saving to you. While the Public Utility Commission has established consumer protection requirements that competitive energy suppliers must follow. The rates offered by energy suppliers are not regulated by the Commission. A “Competitive Energy Supplier” is responsible for obtaining the electricity or natural gas commodity for homes and businesses. The “Local Utility Company” (local distribution company) is responsible for delivering the commodity to homes and businesses. Each month the local utility company sends the consumer a bill that includes the competitive energy supplier’s electricity or natural gas supply charge. Your choice of competitive energy supplier will not affect the reliability of your home’s electricity or natural gas supply.